If YOU ALREADY HAVE A JOB, BUT FEEL THE NEED OR DESIRE TO SEARCH FOR A NEW ONE, HOW IN THE WORLD WILL YOU EVER CONDUCT AN EFFECTIVE NEW JOB SEARCH WITHOUT UNDULY RISKING YOUR CURRENT POSITION? Admittedly, it takes some careful planning and precise execution, but it certainly is possible—if you go about it in a well-thought-out, intelligent manner. While by no means an exhaustive list of things to do (or not to do) to conduct a successful, “under the radar,” new job search without unduly risking your current position, here are at least SIX things to keep in mind. 1. Keep new job search strictly to yourself. Keeping a secret is one of the most difficult things for most people to do. And the more important the secret the more difficult it seems to be to keep it to oneself. 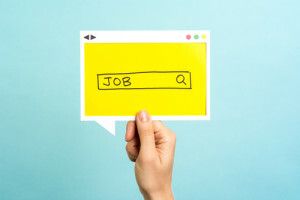 That is particularly true where a new job search is concerned, and the closer you come to actually landing a new job the harder it probably is going to be to keep your new job search under wraps. Surely, you might reason, it would be all right to tell your “best friend” at work, wouldn’t it? Probably not. Remember this: A secret—any secret—is no longer a secret if just one more person other than you becomes aware of it. Keep in mind that your “best friend at work” also has other “best friends at work.” How likely would it be that your best friend at work will feel it’s “safe” to tell his/her best friends at work that you’re looking. Soon, your secret could easily be cascading through the ranks at your current job, and it is extremely likely that your current boss will learn about your “disloyalty” sooner rather than later. 2. Conduct ALL search activities away from current job. Oh, how very, very tempting it can be during a new job search to use your current business email address and/or telephone number to communicate with prospective employers or other hiring professionals. Or, to use your work PC to surreptitiously surf the ‘Net for possible new career opportunities. Or, to use the company copy machine to make “just a few copies” of your résumé. After all, everything you need is right there and so convenient, every day, at your current office! Keep this in mind: Each and every time you use any company equipment or systems for any aspect of your new job search you unnecessarily, and quite seriously, risk being found out and shown the exit far sooner than you probably anticipated! Conduct ALL new job search activities on your own time, never on “company time” or on company premises. Use your own computer equipment, at home or some other “safe” place. Set up and maintain an email address and contact phone number that are to be used exclusively for your new job search. If you don’t have your own copy machine at home or elsewhere, go to a local print shop and pay for any copies you may need. Caution: Many companies today routinely monitor employees’ telephone, computer and Internet usage and activities, and just for the record, they have done so for quite a number of years. So, err on the side of caution and assume that your company is among the many companies that so monitor their employees. While I am making satisfactory progress in my current position, I am always on the alert for new, better career opportunities. Can you recommend someone I should be talking to? 4. Watch what you put in your LI profile. 5. Never call in “sick” or use some other bogus excuse to attend a job interview. If you need time off from your current job to attend a face-to-face interview with a potential employer, do NOT call in “sick” or make some other phony excuse to do so. Either take a vacation day or personal day. If asked why you need time off, simply tell your boss that you have to take care of “some personal business” and leave it at that. If at all possible, take that personal/vacation day (or days) on Friday and/or Monday. “Long weekends” generally do not raise suspicions. 6. Take NO precipitate, foolish actions! Perhaps you are familiar with this Old English axiom: “There’s many a slip twixt the cup and the lip.” Certainly this saying can apply to many things in life, but it definitely applies during a new job search. Let’s say, for example, that you have been working with a headhunter in your new job search. You have successfully cleared all the necessary hurdles with a potential new employer. Things are definitely looking very positive! The hiring manager tells the headhunter that she will be making you a firm offer “in a couple of days.” The headhunter of course relays this great news to you and you are understandably ecstatic! NOW can you openly vent your frustrations with your current job to your fellow employees and gloat about the exciting new career opportunity you are about to land? Absolutely not! Until you have a firm offer, in writing, from a new company, you still have nothing but talk and air. Things can, and often do, head south in a heartbeat. All of a sudden the hiring manager says the position you seek has been put “on temporary hold” for “budget reasons” (or some other internal bureaucratic reason). Happens all the time! There is of course no surefire approach you can take to absolutely guarantee that your new job search will remain secret. There is always an inherent risk of your current employer ultimately learning of your new job search—no matter how diligent or careful you are about keeping it strictly to yourself. However, if you will observe and carefully practice the suggestions and recommendations featured in this post, you will significantly reduce this risk. More importantly, you will also significantly reduce the risk of suddenly and quite unexpectedly finding yourself unemployed and without a paycheck because of your “indiscretion,” thereby significantly increasing the urgency of your new job search! This post is based on career management information and advice featured in Career Stalled? How to Get YOUR Career Back in HIGH Gear and Land the Job You Deserve—Your DREAM Job!, professional “headhunter” and bestselling job-hunting book author Skip Freeman’s NEW book in the “Headhunter” Hiring Secrets Series of Career Development & Management Series of publications. Skip is the President and CEO of The HTW Group (Hire to Win) Executive Search Group. He is also the author of “Headhunter” Hiring Secrets: The Rules of the Hiring Game Have Changed …Forever!, an international bestselling job hunting book on Amazon.com.